Batting: Jos Buttler 67 off 138 balls, Joe Root 68 off 120 balls, DM Bess 57 off 106 balls. 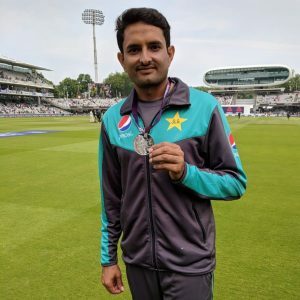 Bowling: Mohammad Abbas 4/41 in 17 overs, Mohammad Amir 4/36 in 18.1 overs, Shadab Khan 2/63 in 19 overs. Batting: Haris Sohail 39* off 32 balls, Imam-Ul-Haq 18* off 34 balls. Bowling: James Anderson 1/12 in 3 overs, Stuart Broad 1/13 in 3 overs. 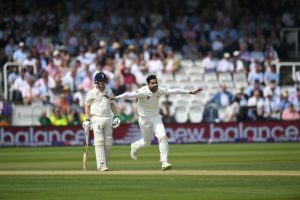 England had ended Day 3 on a positive note as they had been successful to muster up a lead of 56 runs, courtesy of the lower middle order, namely Jos Buttler and DM Bess. Both these batsmen had managed to keep the English boat afloat by sharing a 125*-run partnership between them. On the other hand, Pakistani bowlers had been unable to get rid of these two batsmen as the third day had come to a close. Now, Day 4 started as Buttler and Bess came on the crease with the intention to build this partnership even further. Meanwhile, Pakistan relied on their pacers to get rid of this stubborn partnership as the pair was starting to create problems for Pakistan. 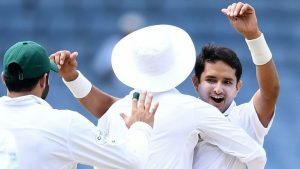 Pakistan’s bowling attack was opened by Hasan Ali as he bowled the first over on Day 4 on this test match. Buttler should have been out in that over, but somehow he survived. But, then the ball was given to Mohamed Abbas who had been the leading spearhead for Pakistan in this test and he delivered in this 1st over. As, he pinned Buttler lbw on the 2nd ball of the 79th over. Jos Buttler chose to review but it didn’t help as the reviews indicated that the ball would have crashed the stumps. Mark Wood now came to the crease and joined DM Bess as England were in dire need of a partnership. But, it was Mohammad Amir who was given the ball by Sarfraz as he forced Wood to edge out to Sarfraz and claim his 3rd wicket of this innings. 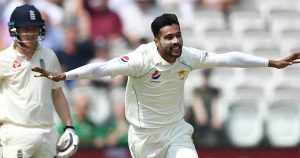 And, this wicket was only the start of wickets as Abbas claimed the wicket of Broad in the very next over and England were now 9 wickets down. The last batsman, Jimmy Anderson now joined DM Bess on the crease as these two became the last hope for England to save this test match. 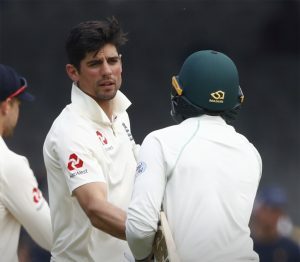 However, Pakistan were in no mood to halt anything as Amir struck in his 19th over and England were all out on 242 runs with a lead of 64 on the scoreboard. It was now Pakistan’s turn to bat and they only needed 64 runs to win this test match. Although, England were dissapointed of how their batting turned out, but they knew Pakitan’s batting line-up’s tendency to fall like nine pins in the 4th innings. And, so it was Pakistan who had a point to prove with their batting; which they did. Pakistani openers, namely Azhar Ali and Imam-Ul-Haq made it out in the middle as both batsmen looked to chase this score as soon as possible. England did not manage to get a wicket in the first two overs, but it didn’t take long for Anderson to get a breakthrough. As, the English pacer shattered Azhar Ali’s stumps in the 3rd over to claim the 1st wicket of the 2nd innings. Haris Sohail now joined Imam on the crease as England looked to take a couple of wickets to get back into this match. Now, historically Pakistan had been prone to 4th innings collapses and England were hoping that they could trigger one such collapse today. However, that did not happen as the two Pakistani youngsters took it upon themselves to see this innings through and win the match for Pakistan. So, in the end both of these prolific young batsmen remained unbeaten as Pakistan went 1 – 0 up in this two test match series. Both batsmen were congragulated by the English players as they walked back to the pavilion. Mohamed Abbas won the award for man of the match for his match-winning figures of 8/64. After this win, Twitter was filled with congragulatory messages from cricket fans and former Pakistan players who hailed this performance of a young Pakistan team who had managed to outplay England in this Pakistan Vs England Test match. Pakistan it is … what a Cracker Jack performance.. not seen a Pakistan side play so convincingly against England in many a years! Nailed it!! End of 1st Test – Day 4 (Pakistan Vs England): That is the end of this test match. Do join allsportspk on 1st June for the 2nd Test of this series between Pakistan Vs England.